Hello, anyone here has moonray S, my boss bought two..we started to print all models.. We had problems with retainers fitting, indirect bonding tray fitting issues....trying to figure out. Any suggestions and tips? Thank you all!! I have the Moonray D. I print models and the occasional surgical guide. What resin are you using? How is your post print processing? Are you curing with a light? Thank you for your reply. We use gray, 30 mins 60 C in Curebox. we have 2, printed for same patient, one is not accurate, called service guy today. 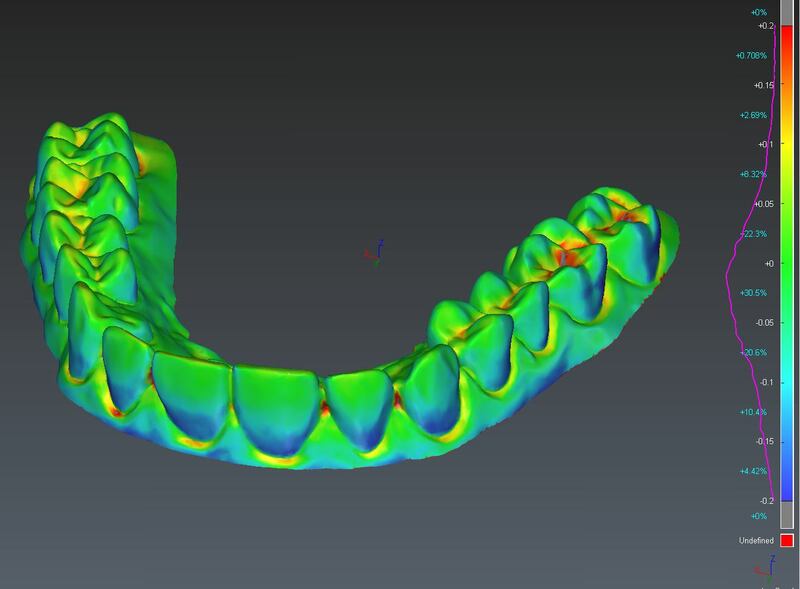 we use biostar to make retainers. Depends a lot on the thickness of the hollowed model, and on the orientation you print the model. The most accurate way to print will usually be a solid model, printed flat on the print bed. Printing hollow may seem like your saving resin, but in reality, unless you're ok with copious drain holes, you're losing most of that resin in the wash process. Printing hollow also introduces issues with internal overhangs, which can affect accuracy. Printing vertically is a somewhat common practice, but almost invariably results in overhangs over 45 degrees, which most printers don't like much, so you lose accuracy. what software did you use Theo ? That one was done with 3DReshaper, which is the prettiest option I've found, and also includes the distribution map on the right, which is nice. You can also do something similar in Ortho Analyzer, it's called "Model Set Compare". Or if aesthetics aren't that important, there's a piece of freeware called CloudCompare that works pretty darn well. Thank you so much, that is what I need to learn.